Mendoza - explore the city of wine and surroundings like the Atuel Canyon in San Rafael - from Nihuel dams and dunes, stunning forms of landscape’s erosion to water sports, whitewater rafting and zip-line adventures. There are many reasons to visit Mendoza – a full of life city at the foothills of Cordilleras on the Argentinean side of the Andean mountain chain. 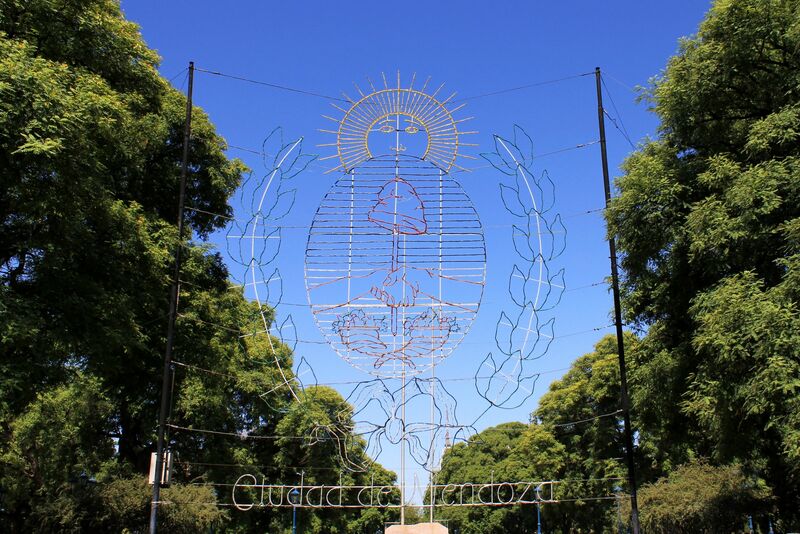 For most tourists, Mendoza is a starting point to high Andes on the famous Uspallata’s road to Santiago de Chile. No wonder – Aconcagua - the highest mountain outside of Himalayas is a strong “magnet” by itself. And on the way you can add to this “road adventure” a natural wonder of Puente del Inca (probably one of the most photographed places in Argentina) or the monumental Cristo Redentor dominating the Uspallata’s pass (accessible only during local summer time). Just these few attractions without even mentioning the Photographic Paradise presented by the picturesque landscape are a good reason to visit the Mendoza Province. Other visitors come here to take wineries tour taking understandable pleasures in tasting great wines for which Mendoza is renowned (tasting is just the “overture” to the next steps in the wine’s fiesta). Some tourists however take also opportunity to look beyond these two obvious destinations choosing a one day trip to the Atuel Canyon. Let me make it clear – I did not see anyone regretting such decision. The truth is that the area of San Rafael has so much to offer that every nature lover or just adventurer can find something for himself. Map of the Los Nihuiles. Click on the picture to get its large size version! Atuel River is a longest river in the Province of Mendoza. Its source is located in high Andes at about 4,000m (13,100ft) above the sea level from where the waters of two streams Cobre and Tordillo run down Las Leñas slope feeding the lake called Lagoon Atuel. From here the Atuel Rivers begins its “official” life. It then meanders south-east reaching the vast rugged terrain of Argentinean steppes and finally joins the waters of the Desaguadero River in the area called Bañados del Atuel in the Province La Pampa. The most interesting part of the Atuel River’s flow is an area called Sierra Pintada (Painted Mountains Range) near the city of San Rafael - about 240 km (148 miles) from Mendoza. It is here where over the distance of about 60km (37 miles) the river traverses the deep canyon, falling along its course from 1250m (4,100ft) to about 700m (2,300ft) above the sea level. Such huge difference of levels turned against the river inspiring pragmatic minds to harvest this immense free energy. 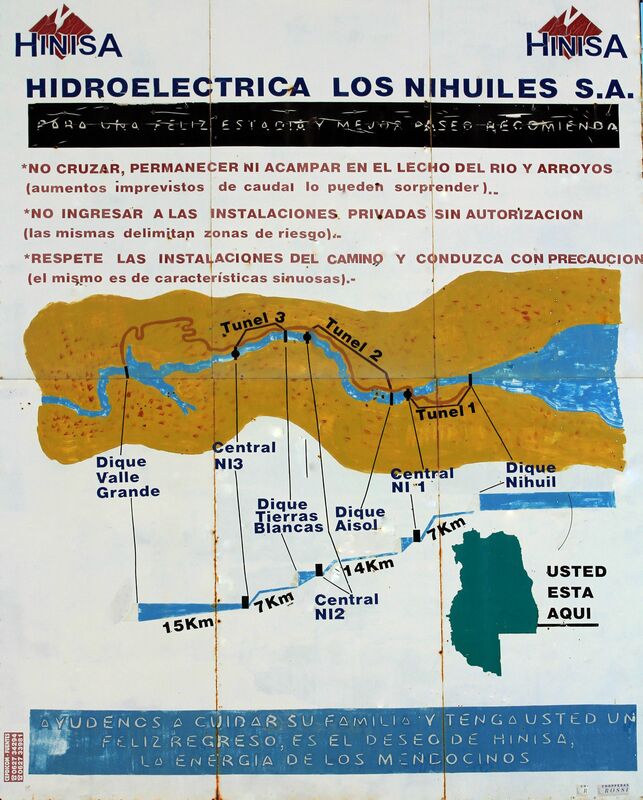 As a result, starting from late 1940’s four dams with hydroelectric power stations have been built along the canyon making a system called Los Nihuiles. To make it worse (some may argue it is for better) along most of the river’s flow through the canyon, the water is contained in underground tunnels excavated in the rock. Only “leftovers” of the Atuel River are “left free” trying to keep the “spirit” of the canyon and some life down the stream, but honestly, along its major part it is rather a moon landscape. But this “secrecy” is largely compensated (from visitors’ point of view) at the last dam - Nihuel IV (Dique Valle Grande) creating an amazing lake encompassing strange “rocky creatures” and bizarre forms of landscape being the part of the surrounding valley. It brings back abundant life in all shades of green and kinds of forms - including fish so bring your fishing gear! Another view of the Los Nihuiles hydroelectric system in Atuel Canyon. Gallery of pictures from the Atuel Canyon. El Nihuil dame creates an immense lake at the entry to the Atuel Canyon. Finally for a change water emerges at the Nihuil II (Aisol Dam)! For most of us the name “Los Nihuiles” does not have any meaning. But frankly, it will be hard to find a better name for this hydro-system. Apparently in the native language of Mapuche (indigenous people of Andes) Los Nihuiles means “Roaring Tigers”. Some linguists argue that this translation is rather expressing the way we want to see “things” than a real meaning of the word El Nihuil. I would say however that what really counts is an almost perfect “match” between the “sense” of this translation and a natural phenomenon described by it, so let it be!